Sometimes it’s really good to have friends. Friends you’ve had since high school. Who maybe went to medical school. And now she’s an ob/gyn. Who lives in my city. Can you guess where I’m going with this? She’s been great throughout this journey – providing access to obsessive me to Fertility & Sterility as well as Obstetrics & Gynecology. Reproductive endocrinology is really not her area of expertise, but she’s tried to help as much as possible. She’s offered scans in the past, and I’ve declined. I’ve always felt guilty. Well, yesterday, I took advantage of her offer. And either the machine at her office is much, much better than my RE’s or the sac had grown a lot or we got a better angle. Or maybe all three. It looked much larger to my untrained eye. It may still be small, but I feel so much better with these pictures. The heart rate was 173, and the baby had grown at least 2.5 mm in the two days since my discharge. They dated it at 8w1d, but my RE dated it at 8w1d at a measurement 2.5mm smaller. Goes to show you how much variability there is in these things, huh? I didn’t actually get a sac measurement, but I feel a thousand times better now than I did before. Maybe I’ll post the two different pictures later and you’ll see exactly what I’m talking about. It’s really good to have friends. ~ by Larisa on June 16, 2007. That is great news! I’m so happy you have such a great friend. I hope you post the pics, I would love to see your beautiful baby! Mrs. Hope, I don’t know you but I’ve been reading your blog since the Statesman article came out. I just wanted to say how happy I am for you and you & your little one are in my thoughts! I can’t wait to see those pictures, and the fact that you are feeling so much better about things makes me really happy. 🙂 Things are looking way up! The pix are great, I’m so glad you got a second scan. We had a similar scare during the beginning of my IVF pregnancy, the sac was strangely shaped we thought. I wen to an ultrasound place and they used much better equipment and the sac looked fine. Talk about scary though. This is just so wonderful, you must feel like you have to pinch yourself! Beautiful pictures. I see what you mean about the 2nd picture…much better! Whew! What a relief. Thanks for sharing those wonderful pics. Baby is looking great. I am so happy to hear that you have some peace of mind now! Beautiful pictures! Glad to hear you are feeling better! OMG…that is the coolest thing 🙂 the picture is great. I just can’t wait to check in on you to hear good news every few days (I’m an old twentysomething from BBC) so far, so good…..grow baby grow. We can will you to keep growing little one? I agree, it does seem there is more room in the sac around baby in the second photo. This is wonderful news. Cool!! This sounds and looks very hopeful! I have plenty family in this field but I never feel comfortable talking to them about it. It makes family get togethers rather uncomfortable but a friend would be much better! So glad you did that second scan, you can really see the different parts of the embryo starting to differentiate, as well as the better ratio of embryo to sac. So hoping this is all turning out for the best, and there will be NO MORE SCARES. What a nice friend, too. So happy you got some good news. Hope there is lots more coming your way! WOW! !that is a beautiful pic! I am so glad you accepted her offer and eased your mind. this is so exciting! And yes, lots of variability, I agree. Glad you have actual proof of that now. Now that’s a handy friend to have! Well, hi there cutie! Thanks for sharing the picture! Wow, if you can totally eliminate the sac size stuff, (whispering) we’re done with the bigger risk factors, right? Ooh, so exciting! Wow, what a difference! I need an OB friend! OMG, i LOVE baby pictures! so happy for you and i’m glad you’re feeling a lot better as well. CONGRATS, MOMMY! So very happy to read about the better scan results. 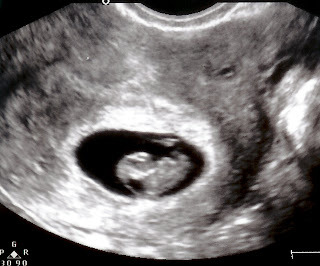 In my current pregnancy the embryo measured 2 days small at 6 weeks, 4 days behind at 7 weeks after spotting, at 8 weeks it was still small but there had been 7 days’ worth of growth. 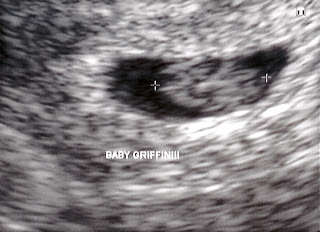 The next scan was at 12 weeks and at that point all the measurements came out where they were supposed to be. I am really hoping your pregnancy goes the same way and that it will be easier for you in the second trimester. Great friends make life so much more livable. That is so awesome! Got chills just looking at the pics! Sending you tons of best wishes for a continued healthy 9 mos. Just found your blog. I just wanted to tell you that we were told that our sac was too small too, (at about 8 weeks) and that I had a lot of bleeding/spotting throughout the first trimester (I had 2 subchorionic hematomas). I’m at 25 weeks now and everything seems to be going fine. There is just no way to predict, but it can all be scary and end up ok. My best to you. Congratulations! I’m so happy to hear how it’s coming along. Sending good wishes your way for the rest of the journey. That is awesome news!! Congratulations!